At last the final regulations are published! There are a few changes from the draft rules, but nothing major. The best thing? Borrowers can access payments set at 10 percent of "discretionary income" regardless of when we borrowed. Less great: If you borrowed for graduate or professional education, forgiveness is after 25 years rather than 20 years (or 120 payments for Public Service Loan Forgiveness) and spouses will not be able to separate their income, even if they file a separate tax return. ​It doesn't matter when you got your loans. 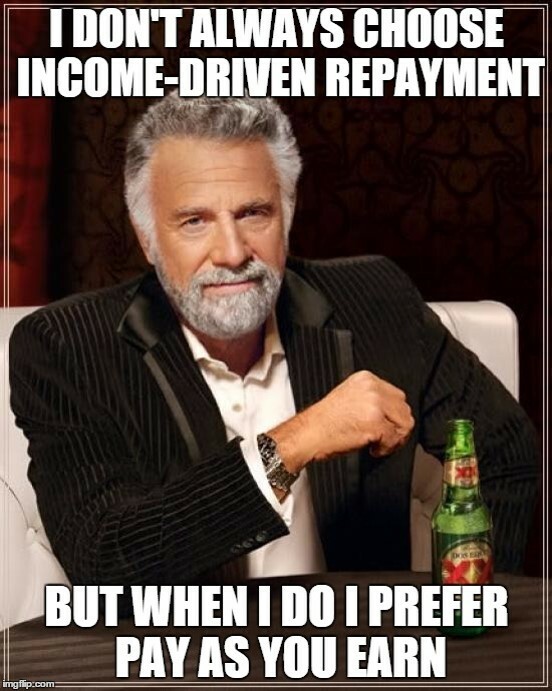 Monthly payments are 10 percent of “discretionary income”. No Partial Financial Hardship is required. Eligible for Public Service Loan Forgiveness. If your payment does not fully cover interest charges, you will be charged only 50 percent of the unpaid interest (during periods of negative amortization, meaning if your payment doesn't fully cover interest). ​Your spouse’s income will be included in calculating your monthly payment amounts, even if you file a separate federal tax return. There is no cap on the monthly payment. If you borrowed only for undergraduate education, forgiveness is after 20 years of repayment but f you borrowed any amount for graduate or professional education, forgiveness is after 25 years of repayment. Implementation will be in December, no specific day set yet. Oh, and don't forget that REPAYE creates another option for borrowers--it does NOT replace or eliminate any of the other plans. PAYE is way better than REPAYE for everyone who meets the definition of an "eligible new borrower" under PAYE.